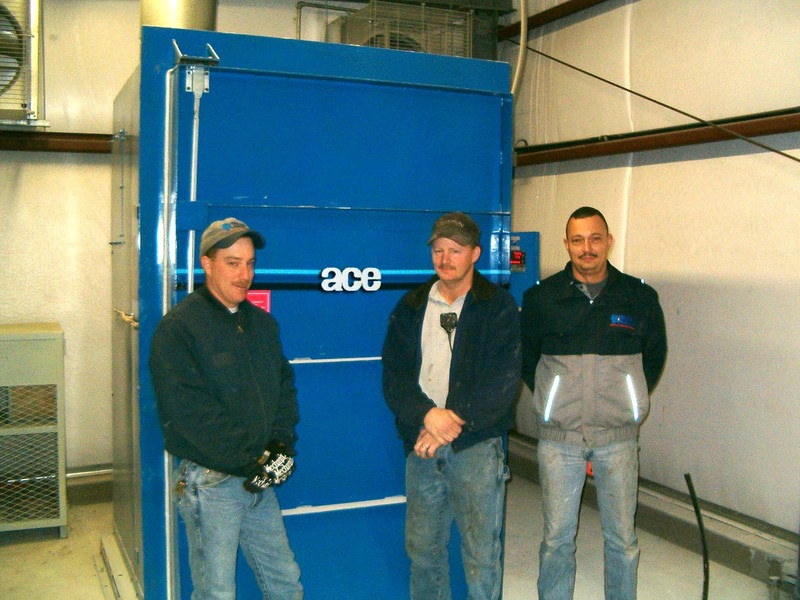 Propane Cylinder Exchange Company chooses ACE burn off oven to keep its paint racks clean. Blue Rhino (Hamptonville, NC) is a major supplier of gas grills and outdoor fireplaces, and operates the nation’s largest propane cylinder exchange operation. The company was having difficulty keeping paint racks clean. In the past, Blue Rhino would have to hand clean their racks and hooks, which involved Blue Rhino employees using dangerous chemicals and spending hours scraping, grinding and chipping away at the problem coating on the parts. The heavy labor and hazards from chemicals motivated Blue Rhino to seek an outside cleaning source. The company began sending parts to a job shop stripping company, but after experiencing the high cost (60 cents per rack) and damage to parts, Blue Rhino decided to bring this job back in house. But they needed a better way to clean parts without the high labor and materials costs. 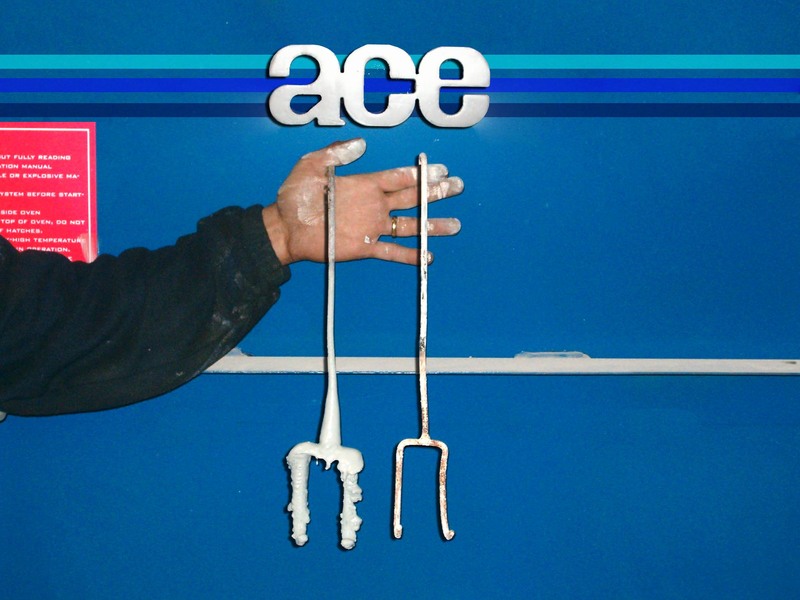 Blue Rhino then contacted ACE Equipment Company (Cleveland, OH), afamily-owned company in business since 1919, for help. A typical problem in some burn off ovens is uneven heat—a cool spot can form at the front of the oven by the door and a hot spot is found to the rear of the oven near the heat source. The ACE oven system provides uniform, even heat with no hot and/or cold spots. A plus/minus 10° F uniformity is held. The unique radiant tube heating provides convection but also radiant heat which is wasted in other ovens. Please clarify this section. No hot or cool spots b/c of the radiant/convection action? Why is radiant heat wasted in other ovens? Other ovens use only convection heat. Efficiency is only a maximum of 65%. Uniform heating also means that the system will last longer because there is less stress on the oven. 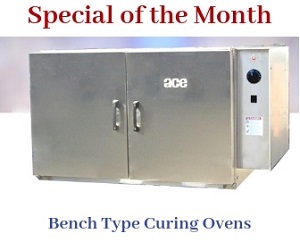 The ACE oven is the only one manufactured from 11-gauge steel for longer life—a typical ACE oven system lasts 15 to 25 years. The system is also energy efficient—a typical time cycle is three to four hours at a cost of around $8 per hour. After installing the oven system, Blue Rhino now enjoys the benefits of clean parts with easy operation, and they can strip all their hooks on the paint line in one shift. Parker appreciates the fact that “we have the capability to burn parts from our multiple locations. Your burn off oven is a real asset to the maintenance department at Blue Rhino of Hamptonville. Scott Heran is Vice President of ACE Equipment Company (Cleveland, OH). He represents the next generation of this. Can be contacted at (800)-255-1241; (216) 267-6366; or visit the Web site at www.armaturecoil.com.